The recently-introduced Gene-pool Optimal Mixing Evolutionary Algorithm (GOMEA) family has been shown to be capable of excellent performance on academic benchmark problems, outperforming other state-of-the-art EAs, especially when efficient partial evaluations are possible. This holds true also for the latest extension, the Multi-Objective Real-Valued GOMEA (MO-RV-GOMEA). 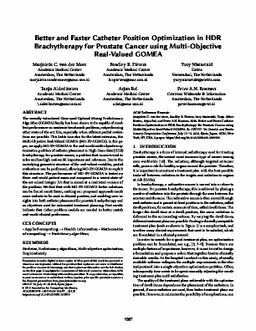 In this paper, we apply MO-RV-GOMEA to the real-world multi-objective optimization problem of catheter placement in High-Dose-Rate (HDR) brachytherapy for prostate cancer, a problem that is non-trivial to solve and has high real-world importance and relevance. Due to the underlying geometric structure of the real-valued variables, partial evaluations can be performed, allowing MO-RV-GOMEA to exploit this structure. The performance of MO-RV-GOMEA is tested on three real-world patient cases and compared to a recent state-of-the-art mixed-integer EA that is aimed at a restricted version of the problem. We find that with MO-RV-GOMEA better solutions can be found much faster, making our proposed approach much more realistic to be used in clinical practice, and enabling new insights into both catheter placement for prostate brachytherapy and on objectives used for automated treatment planning. First results indicate that richer problem models are needed to better match real-world clinical preferences.